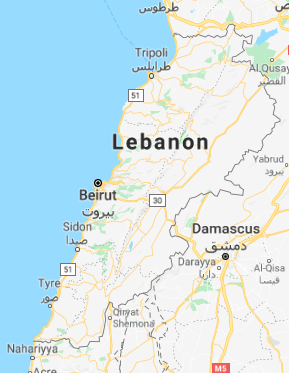 “Lebanon.” Map. Google Maps. Google, 31 Oct. 2018. Web. 31 Oct. 2018. Lebanon has been home to several civilizations over the course of thousands of years, including the Phoenicians, Greeks, Romans, and Ottomans. Presently, it has one of the most diverse populations in the Arab world in regards to ethnicity and religion. Lebanon’s capitol is Beirut, which was once named the Paris of the Middle East. Ola, a first generation Lebanese woman, immigrated to the United States in 1994 with her husband and daughter and she has not been able to return to Lebanon since. Ola had a rough childhood growing up during the civil war in Lebanon. She recalls the war arising when she was about two years old, and it had a great impact on her childhood along with her education, but it never caused her to feel anything but love and pride towards her country. Surprisingly, Ola expresses that cultural clothing is not of great importance to her or her family. She states that in Lebanon, cultural clothing is not as “big” as it is in other countries, such as Palestine. However, she adds that many Muslim women wear a abaya. She explains that a abaya is, “a beautiful long dress with long sleeves, has decorations or like stitching on it, maybe beads or sequence like these things.” Ola thinks that religion plays a role with the way the abaya is designed. She also states that many Lebanese tend to follow Western dress patterns. She states this, “like in the South the religious people they wear abaya, but the modern people they wear modern clothing, so this is how it is.” Ola respects her religion and wears the abaya at appropriate times like when attending Friday congregational prayers at the local mosque. Her daily clothing consists of jeans and a long-sleeve top that covers her body well. Ola also adorns the Islamic headscarf called hijab. Her oldest daughter dresses in the same way as Ola, while her younger daughters dress similarly but lack the scarf on their head. Ola explains that besides the abaya, there really is no cultural clothing for the Lebanese people and although cultural clothing is not a part of Ola’s daily life, she values her Lebanese culture and emphasizes that her children value it as well.